Hip Homeschool Moms. A Vibrant Community for Homeschooling Families. Homeschool Road Trip to Explore the World’s Longest Cave System! Are You Ready to GoRVing? 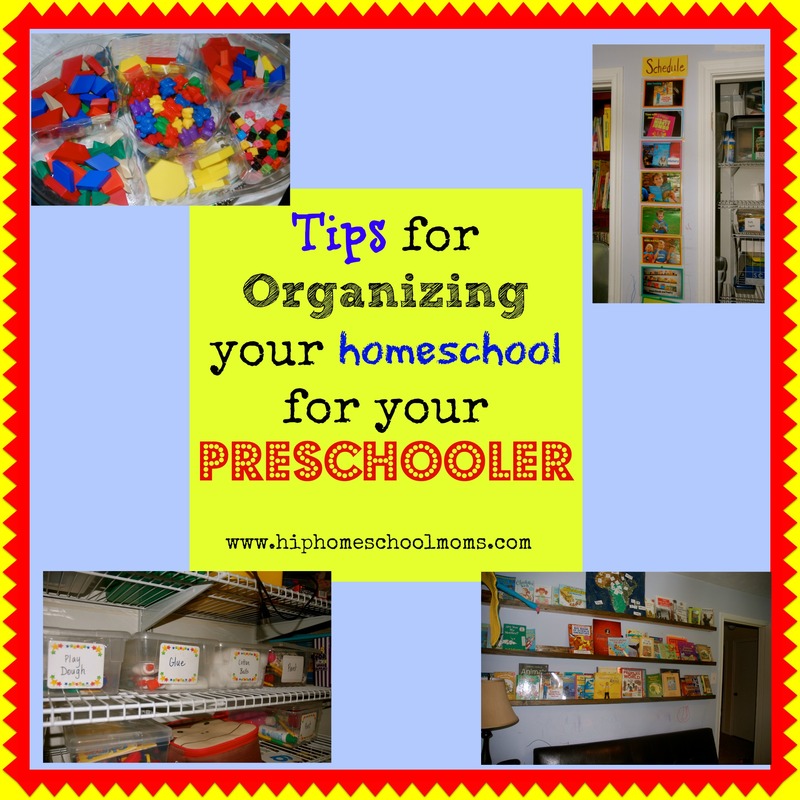 I’m preparing our homeschool room for fall 2014, and I’m focusing on organizing the homeschool room for our preschooler and toddler this year. 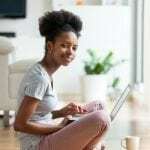 Successful homeschooling when you have little ones is highly dependent upon organization, time management, and knowing how to keep the little ones occupied so that you can accomplish homeschooling the older children. 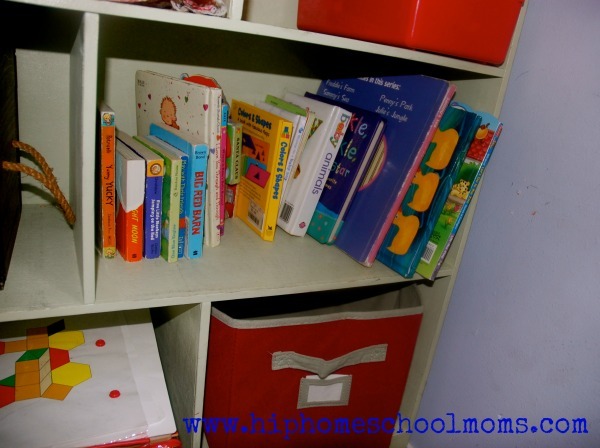 These are my tips to keep your homeschool room organized and maintained on a daily basis to maintain your sanity and not fall behind on school work. I love self directed learning. I love hands on learning. However, I’ve learned the hard way that when you get wrapped up in teaching your older children, small children can really tear apart a room. This makes my day really long and hard. I keep manipulatives, puzzles Melissa and Doug puzzles are great for little ones! ), and office supplies high on a shelf to make less of a mess. 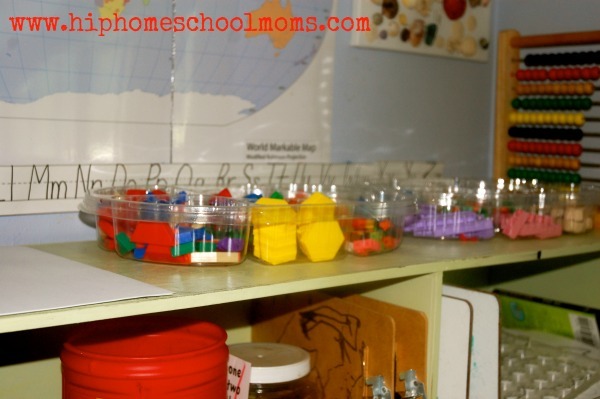 Have lots of manipulatives in easy-to-store containers. 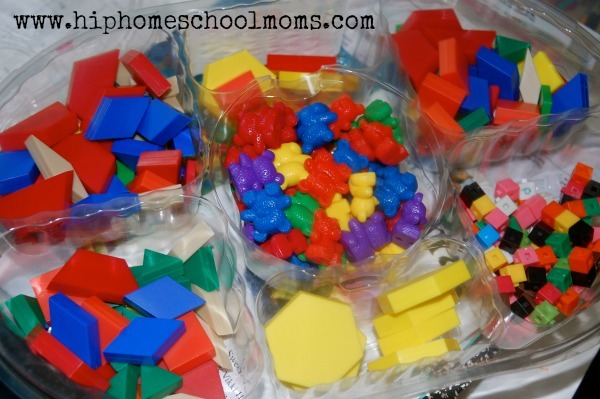 I use counting bears, tangrams, and unifix cubes on a regular basis. I use old fruit trays from Sam’s Club to organize mine on a budget. This helps reinforce responsibility to clean up the manipulatives when finished and also teaches sorting skills. Hardback books, as well as expensive ones, are called ‘fancy books’ in our home. Keep these up high. I am a huge advocate of making books accessible to little hands, but some books belong out of reach until there is adult supervision. It’s also a beautiful decoration piece when you are all finished. My husband built these ‘ledge shelves’ for me (I got the idea from Pinterest), and I don’t know how I’ve lived without them before this school year! (Here’s a tutorial if you’d like to build your own ledge shelves.) I’ve lost too many book jackets to count to eager toddlers and preschoolers. 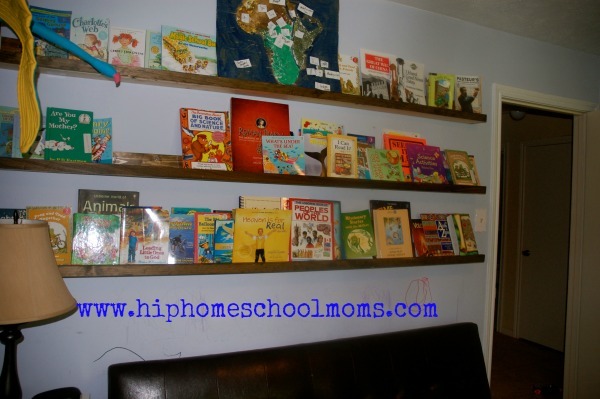 These ledge shelves are cheap to make and beautiful to look at! Make ’em, folks! When I need five more minutes to teach spelling or history, our new fish tank helps distract the little ones. 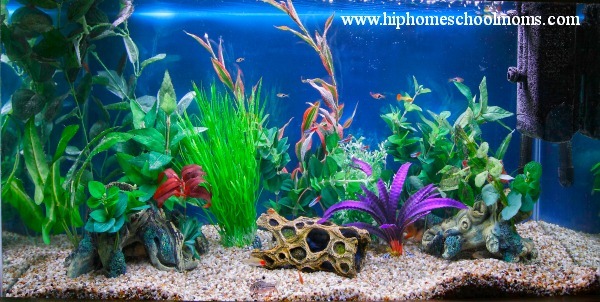 They can feed the fish, count them, name their colors, or give them new names. It’s a great tool for learning and distraction. If you don’t have the budget to get a large tank (ours was a hand-me-down), even just a simple bowl and a beta fish can ignite your preschooler’s imagination. Craigslist and local Facebook Resell groups are great places to find a used tank. Although I protect our ‘fancy books,’ board books are free range! I keep them down low on a shelf and rotate them often. You can bring out books that go with the seasons, holidays, or a unit you’re studying. You might be surprised to find even your toddler sitting and “reading” independently when you walk by the ‘low’ book shelf one day. A brand new oil pan only costs about $30. You can purchase them at any auto repair shop (O’Reily’s, Auto Zone, etc.). They can be written on with dry erase marker, are magnetic, and are perfect for felt board characters. I keep Command Strips (that Velcro) on the back of mine so I can easily take it off the wall if I need to. Literacy starts in the most basic areas of life. Everyday life is what we need to equip our children to handle. So, I like to label all my supplies in tubs. I also *try* to do this with toys and book shelves as well. When preschoolers begin to learn their letter sounds, you can point out all the words around the room they can now decode. It helps them learn independence and feel like a big kid. Any teacher supply store has ‘cute’ labels like those in this picture. However, a good old index card also does the trick. This school year I took hand prints of all my boys and let them paint some 4×4 pieces of board to decorate a blank wall in our schoolroom. Whenever friends see them, they love the idea. So do my boys! “Look how small I was!” “Look how big my hand has grown in one year!” How I WISH I had started this tradition when my first child was a preschooler. It’s so easy. 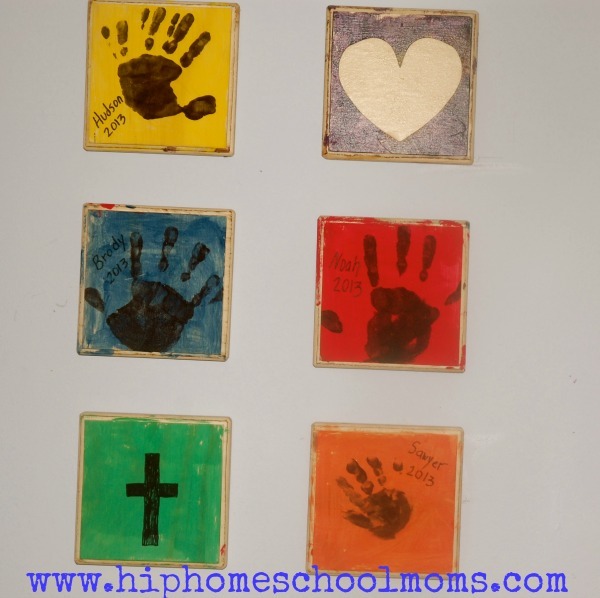 Can you imagine how glad you’ll be to have all those hand prints on the wall after they graduate from high school as you look back at your homeschooling years? 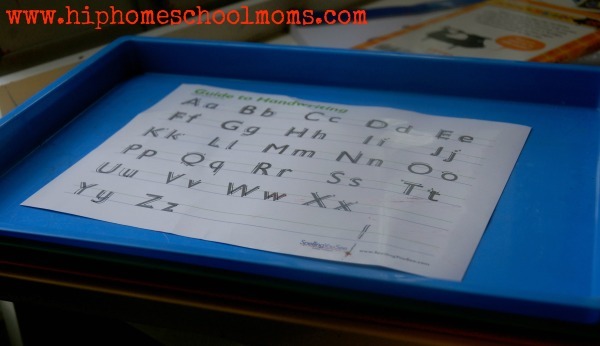 You can check out all the pictures from my homeschool classroom here. I also have a video tour on YouTube here. 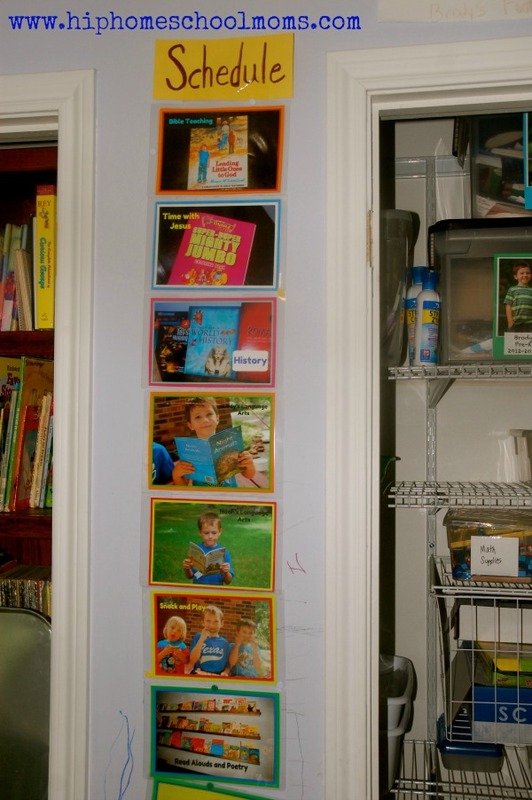 What are your tips for organizing your homeschool room for little learners? Need a FANTASTIC Resource for Teaching Your Dyslexic Child to Read? Enter This Giveaway! Liz was a cheerleader swept off her feet by the football player back in high school. They are the proud parents to four boys and one girl. She’d always envisioned working and sending her kiddos off to school so she could live the ‘normal’ American dream. However, life and the Lord surprised her and she’s learning to ‘redefine having it all’ while being a homeschooling housewife. She enjoys finding strength from God’s word, the Today show, talking on the phone with friends, and being real about finances and parenting. We also have a fish tank. I actually keep mine outside on the porch but in front of a window. We had a problem with hands in the tank. I have a climber!! 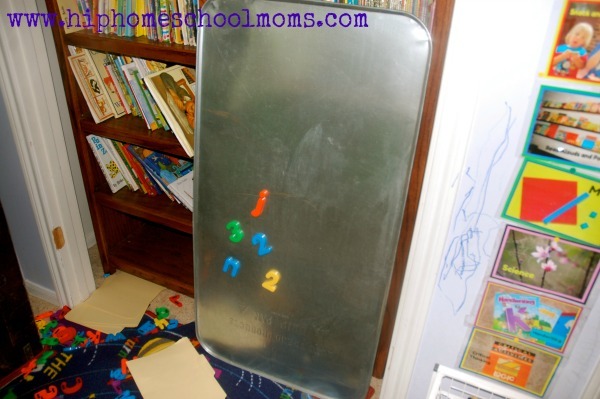 Love the oil pan, we also use baking pans they are great for lap work spelling games. Copyright © 2018 Hip Homeschool Moms ® All Rights Reserved.